Map view of Macauley and Giggenbach submarine volcanoes. NZASRoF'05 submersible dive site and Macauley Island are indicated. Giggenbach is in the NW corner of the map. The Pisces dive area is on the eastern rim of Macauley caldera. The map contour interval is 100 meters. The resolution of the bathymetry data is 25 meters. Click image for larger view. View the slide show of some of the diverse biological fauna and marine life that the Macauley cone hydrothermal system supports. In some geological settings, submarine eruptions can be sufficiently voluminous to construct a volcanic edifice that grows high enough to emerge above sealevel. We can all think of modern examples like Hawaii and Monserrat. Some of us may also be able to name older famous island volcanoes like Krakatau. For a number of reasons island volcanoes tend to be not long-lasting over geologic time. Some like Krakatau, have explosively erupted, destroying the edifice to produce fine-ash and pumice that is dispersed by winds and currents. In other cases, loose volcanic materials of newly emerged volcanoes are eroded away by wave action. In these cases you might have a series of small island volcanoes that periodically appear and disappear. For instance, there are records from sailing ships in the 1800's travelling through the southwest Pacific of seeing small steaming islands that do not exist today. 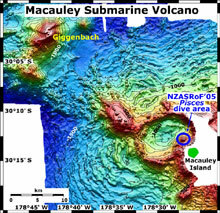 We are currently diving on the submarine flanks of one of the Kermadec island volcanoes - Macauley. Macauley Island is the emerged remnant (about 5%) of a larger submarine volcano - 95% of the volcano lies beneath the sea. Based on previous work and recent seafloor multibeam mapping, we know that the volcano violently erupted 6,300 years ago to produce gas-charged pyroclastic flows and collapse of the caldera by a depth of 500-700 metres. This eruption was unusual in that it was dacitic in composition. The prominent white band seen on the northwest side of the island is the only onland record of this dacite eruption. The submarine record of the eruption is a series of concentric ridges on the seafloor formed by the collapse of the eruption column and radial flow down the volcano flanks. However, that was not the end of the Macauley's volcanic eruptions. 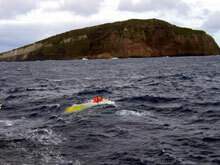 Pisces V surfaces after a dive in front of Macauley Island. View is from the northwest showing the white band in the cliff-face that is made of dacite pyroclastic flows.. Click image for larger view. Pisces V samples deposits of elemental sulfur (yellow) that were extruded on the seafloor. Click image for larger view. Following the 6,300-year old caldera eruption, the volcano has reverted back to basaltic compositions. Numerous basaltic cones and vents dot the caldera rim and inner wall. 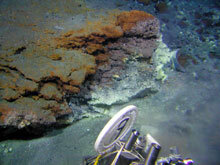 The largest of these is 1.5 km wide, 600-700 m high and hydrothermally active. This cone is the current target of the Pisces V dives. The top of the cone is at a depth of 260 m. We have discovered that the crest of the cone has a 80-m wide and 80-m deep crater from which escapes diffuse hydrothermal fluids dominated by sulfur. 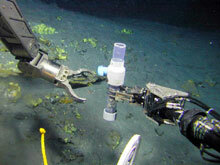 We have seen abundant evidence of molten elemental sulfur being extruded on the seafloor here. Much of the pit floor and wall comprises a mix of altered volcanic sediment, basaltic scoria, and basalt outcrop. Even this pit shows multiple cycles of volcanic and hydrothermal eruption. These yellow outcrops of elemental sulfur were clearly extruded in a molten state and then solidified in place as they cooled. Click image for larger view. Highly altered volcanic sediment above a hydrothermal vent at the bottom of the crater at Macauley cone. Click image for larger view. 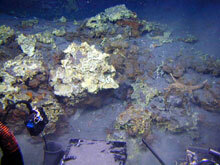 Like Monowai, the Macauley cone hydrothermal system supports diverse biological fauna. We see extensive beds of mussels feeding on, in part, the sulfur-based bacteria, but there are also differences. Here at Macauley the main predator feeding on the mussels are starfish with few crabs. We have also seen flatfish foraging across the seafloor. These flatfish are remarkably similar to an unusual species that some of us found at hydrothermal active volcanoes in the Mariana Arc during the 2004 Submarine Ring of Fire expedition. Such discoveries are important since the seafloor and waters around the island are a protected marine reserve. During our explorations we also encounter some of the non-vent species that inhabit Macauley cone, such as a colorful coffin fish and an inquisitive groper fish.